The 10 Best Places for Fried Chicken in West Virginia! Fried chicken is about as American as you can get. What’s not to like about this crispy, golden brown poultry favorite? It’s popular all over the country and each region has its own special recipe for creating a mouth-pleasing chicken dish. Check out some unique takes on traditional fried chicken in our 10 best fried chicken places in West Virginia. If you like fried chicken that’s crispy on the outside and moist on the inside, then you need to try Chester’s Chicken in Ripley, West Virginia. This surprising little franchised chicken place is hidden inside the Shell gasoline station, but don’t let the size keep you from visiting. They also serve breakfast sandwiches and are sure to give the Colonel a run for his money. Not your Mama’s chicken, but some of the best chicken dishes anywhere around. You have to try their signature Dirty Bird sandwich, which is made of a fried chicken breast, Cheddar-Jack Cheese, bacon, a friend egg, country gravy, and a buttermilk biscuit. That’s country in your mouth! They also have a popular sandwich called the Vera Cruz, made of a fried chicken breast, Jalapeño peppers, Pepper Jack and Swiss cheese, mushrooms, avocado, bacon, lettuce, tomato, and onion, served on a bun with cilantro lime mayo. You can really have chicken any way you like it at King’s Chicken Rotisserie & More in Martinsburg, West Virginia. Their unique “Italian touch” rotisserie chicken gives a new meaning to fried chicken. Open seven days a week, they also offer call-ahead ordering, catering, and delivery within a 5-mile radius. This is comfort food at its best! You can get a whole chicken, a half chicken, or any parts in between, along with great traditional sides like mashed potatoes and gravy, green beans, and corn, but they also have beans & rice, yucca, and plantain. A children’s menu is available, too. Bojangles’ Restaurants began with the idea that you don’t have to compromise good food for fast service. Combining their desire for great flavors, high-quality products, and a friendly and inviting atmosphere, each location is considered a quick-service restaurant, but you won’t feel like it. With specialty sandwiches like the Sweet Cayenne Cajun Filet Sandwich, a thick chicken filet smothered with Jalapeno/American cheese, smoked bacon, and a creamy Cajun sauce on a buttered bun, you’ll wonder how you lived without it. 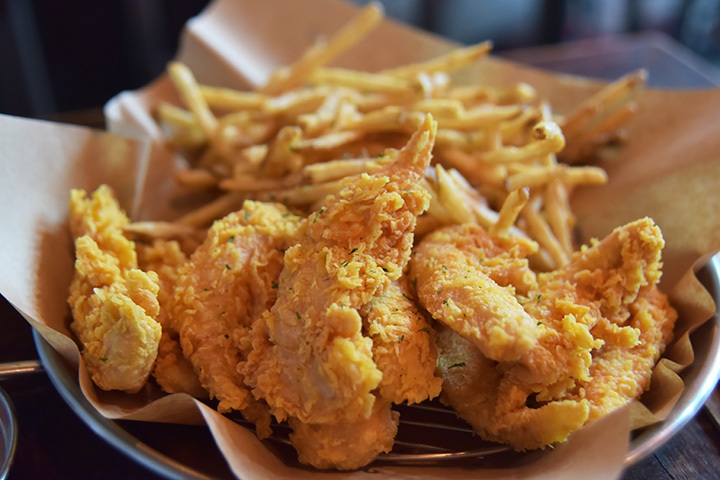 With a long love of food and the desire to provide hospitality, it’s no surprise that Roosters has become a favorite in a tristate area that includes Ohio, Kentucky, and West Virginia. This fun and casual eatery offers great burgers and sides, but they’re known for their chicken sandwiches, like the Cajun chicken breast sandwich, the parmesan chick sandwich, and the fried chicken sandwich. They also have award-winning wings and a great kids’ menu. If you love traditional fried chicken, but want to move out into something new and exciting, visit Table 9 in Morgantown, West Virginia. Hungry diners will find a non-traditional spin on old-fashioned favorites, like the buttermilk fried chicken with honey, hot sauce, and sesame seeds. Their crispy chicken wings are not your average wings either, and are made with a house barbecue or Sriracha Buffalo sauce by in-house chef and owner, Mark Tasker. This is food and drink elevated to a whole new level. Station Square in Nutter Fort, West Virginia, makes chicken the way Grandma used to make it. Tender, juicy pieces of chicken fried to a crispy finish and seasoned just right are paired with potato wedges and any other side of choice for a taste of home. Great food and great service. Don’t forget to top off your meal with a piece of homemade peanut butter fudge. Located inside the Alpine Lodge in Davis, West Virginia, is a hidden secret. It’s the Sawmill Restaurant where hungry diners have been enjoying honest home-style cooking and comfort food for years. Open every day except Thursday, visitors can enjoy simple, but filling breakfast, lunch, and dinner meals like fried chicken and homemade biscuits and gravy and freshly baked fruit and meringue pies. Another surprise from the Mountain State is Bluegrass Kitchen in Charleston, West Virginia. This is not your typical chicken joint, but rather a farm-to-table eatery that specializes in creating unique and flavorful combinations. You’ll definitely want to try one of their signature dishes, like the pickle-brined fried chicken served with kale and whipped cauliflower, or the trout and grits combo served with kale and a bourbon mustard-dill sauce. This is another one of those surprising little diners that have great food and customer reviews on social media. Olde Country Diner in Martinsburg, West Virginia, has a very loyal following people who love their food, especially their down home fried chicken that’s hand-battered and fried to heavenly perfection. You can add soup and salad and a piece of banana split pie and you’ll be set for the day.